In Pearl's Hill Terrace in the heart of Chinatown, amid Housing Board flats and the People's Park Complex, lies a secret. Herein lies a former police bunker where all 999 calls in Singapore were once answered and where the police managed operations to deal with security threats like the 1956 Chinese middle-school riots. Called the Combined Operations Room, it served as the nerve centre for police communications from 1956 to 1988. Now, for the first time, the British-built bomb-proof facility will be buried in secret no more and will be open to the public, starting today, for three months. The public will be able to sign up for tours of the place, as a result of a joint effort by the Ministry of Home Affairs, the National Heritage Board (NHB) and the Singapore Police Force. Visitors can view the Home Team's SG50 exhibition and walk through eight refurbished rooms recreated according to what the bunker had been like when it was operational. The rooms include the Chief Police Staff Officer's room, which has a large glass window overlooking another room where staff put up updates about incidents across the island on a tote board and map in real time. A saucer-shaped multi-sided podium was also recreated for what used to be the Radio Control Room. Phone operators known as the "Triple 9 Girls" received all emergency calls and dispatched police assistance from this podium. The 999 calls are now picked up from the Police Operations Command Centre at New Phoenix Park. One of the operators, Ms Sadiah Joko, 55, recalled picking up calls for two major disasters: the 1983 Sentosa cable car tragedy and the 1986 Hotel New World collapse. Recalling the Sentosa accident where seven people died after two cable cars were dislodged by a passing drillship, she said she remembered her growing horror as multiple panicked calls came in reporting "bodies falling from the sky". "A few calls later we understood what was happening - that a ship had entangled with the cars. It was disastrous," she said. 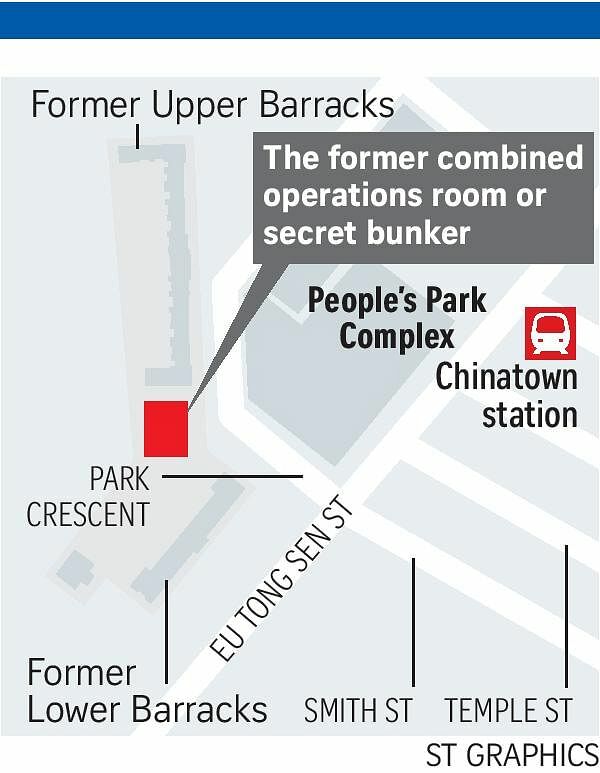 •The bunker was where joint operations were conducted to deal with internal security threats such as Konfrontasi and the 1969 racial riots. •The authorities were prepared to execute Operation Photo, should then Chief Minister David Marshall's 1956 talks with the British for Singapore's independence fail and chaos ensue. The plan was to activate troops early during disorders. •In the Chief Police Staff Officer's room was a telephone switchboard that had direct lines to issue commands to police and army units islandwide. •The bunker's original air-conditioner engine, a large machine with steel gauges and valves, is likely to be the only one from that era that is still standing in Singapore. It was rare for buildings to be air-conditioned in those days. Other phone operators and police officers, such as Mr George Mathews, 65, now retired, recalled early Singapore as rather chaotic with numerous gang fights and turf wars. "Within eight hours, I had to respond to 12 to 13 messages," he said. Parliamentary Secretary for Home Affairs Amrin Amin, who officially opened the bunker yesterday, said: "The exhibition is dedicated to our pioneer officers who worked tirelessly to build a strong foundation for the safety and security that we enjoy today." The NHB, which was roped in in July last year, delved into archival materials and the oral history records of police personnel who worked there. NHB's assistant director of research John Kwok said: "Many of us had no idea about the existence of the bunker and what stories it held. The air was thick with dust when we first visited. But it has turned out to be a gem." He said the use of radio technology in the 1950s and 1960s meant police cars could be dispatched quickly to the scene of unfolding crimes. For this reason, Singaporeans called them hantu (ghost) cars for appearing speedily out of nowhere. Operations at the bunker ceased in 1988. In 2001, the Singapore Land Authority took over the building and it was used as a storage facility. The bunker is not conserved although it sits alongside the former Upper and Lower police barracks, both of which were conserved in 2008. Ms Sadiah said she is glad the once "secret and heavily guarded" building will now be open to the public. "The public will really be amazed to see how the police worked and managed incidents islandwide from a small bunker," she said. E-mail fcor@mha.gov.sg or call 9893-5140 to book the tour which runs from today till Jan 31. Tours will be conducted from Tuesdays to Sundays, excluding public holidays, at 10am, 10.45am, 11.30am, 2pm, 2.45pm and 3.30pm.